Here is another entry that will give you an insight into how I have come to understand and practice magic. As with the last blog entry this is part of the same group of workings I did over the course of a week at the beginning of this year, using the invocations of the day for the angel and the spirits of the air of the day from the Heptameron. Before I start I am going to post a quote from one of my favourite authors, which will be best kept in mind when reading today's entry. "Esotericism should not be understood as a rebus or a secret writing, but rather as the "spirit of the letter"-that is to say, that which cannot be transcribed clearly, not because there is any desire to conceal it, but because of the "cerebral" intellect's inaptitude for comprehending it"
R.A. Schwaller de Lubicz. "The Temple In Man"
Are subject to the south-west wind, there nature is to give all metals, to reveal all earthly things past, present and to come, to pacify judges, to give victories in war, to re-edify and teach all experiments and all decayed sciences, and to give infirmities or health, to raise the poor and cast down the high ones; to bind or loose spirits, to open locks or bolts. Such kind of spirits have the operation of others but not in their perfect power, but in virtue or knowledge. “To reveal all earthly things, past present and to come.” Represents the manifestation of the trinity aspect of divine consciousness. 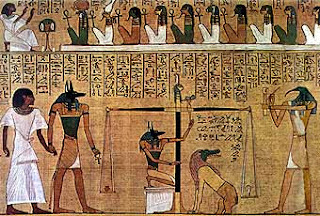 This is distinctly shown in The Egyptian Book of the Dead; “I am Yesterday, Today, and Tomorrow, and I have the power to be born a second time”. This second birth is the spiritual birth of divine consciousness, represented by Horus, the Christ consciousness. Which is also given in more or less the same words in the New Testament. Hebrews 13:8. “Jesus Christ the same yesterday, and today, and for ever”. The subconsciousness is yesterday, which represents the memory of our past. i.e. our divine origin. The consciousness is our present awareness “today” while living in the now . Tomorrow represents our higher consciousness which is unfolding for the future. All these three aspects of consciousness are realised while in our earthly state of being. It is our time line from remembering our divine origin to working on it now for the evolution of our divine state of being. If we apply this to ourselves, then Thoth or the spirits of Mercury are representative of the forces of intelligence which records our experiences upon the inner nature of our soul, and through the communication of these we must seek to be more favourably inclined to the judgements from others and ourselves, because it is through theses experiences that we are continually judged throughout life, and which will eventually lead us to the manifestation of a spiritual state of being and apotheosis. The battle of Kadesh is a perfect example showing the triumphant victory of the higher spiritual nature (light) over the forces of the lower nature (darkness). 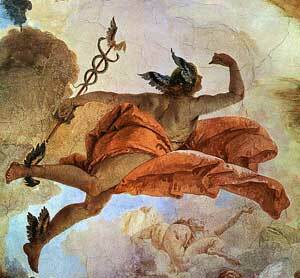 Now as Mercury is linked to the intelligence and therefore the forces of the higher spiritual nature, it can easily be seen why the spirits of the air of Wednesday are said to give victories in war! This is the war that is continually being fought within our soul, and for the higher spiritual nature to evolve, it must subdue the lower self and bring it under control so that equilibrium is restored, and we can enter the temple of the holy spirit to commune with our divine nature. “to re-edify and teach all experiments and all decayed sciences”. To me this seems to be a hint that the mercurial spirits can teach the lost allegorical language, also known as the language of the birds. It is something I have used different mercurial spirits for. But, also out of interest, there is in the book of the Goetia the 53rd spirit called Caim, who it is said of; “his office is to give men ye understanding of all birds” . He just so happens to be a president, which is a mercurial spirit! “to give infirmities or health”. I take this to mean that the mercurial spirits can cause a weakness like a moral flaw, or failing, such as theft which is an attribute of mercury, along with deceitfulness and cunningness. It is often said that some criminals have a high intelligence, which is a mercurial trait but, if the intelligence is misdirected towards the wrong ends, then the negative attributes of mercury are likely to ensue causing infirmities. “And behold there was a woman who had a spirit of infirmity eighteen years, and was bowed together, and in no wise lift up herself. And when Jesus saw her, he called her to him, and said unto her. Woman thou art loosed from thine infirmity. And he laid his hands on her: and immediately she was made straight, and glorified God” (Luke 13:11-13) With this passage it shows the lack of completion in the lower nature of the soul, (because the word “woman” in the symbolic sense represents the lower emotional-astral nature) but through the higher spiritual nature (Jesus) one can be set straight again on the path of spiritual development to help heal the soul. Who are the “high ones”? There are many stories about high ones being cast down, like Saturn who was cast down to the depths of Tartarus, and the many instances in the Bible where the hosts of heaven are cast down to earth. “And it shall come to pass in that day, that the Lord shall punish the host of the high ones that are on high, and the kings of the earth upon the earth. And they shall be gathered together, as prisoners are gathered in the pit, and after many days shall be visited” (Isaiah 24:21-22) But, why were they cast down, and why would it be of use to the magician? The answer to this is summed up rather well by Iamblichus when talking about the powers that come down from heaven. “These, therefore, descend with invariable sameness for the salvation of the universe” (On The Mysteries page 68) For it is the powers of heaven that the magician shall bring down in order to aid the spiritual evolution of his or her soul. “to open locks or bolts”. This is obviously not meant to be taken literally because all one would need to use is a key! Not a spirit. Locks or bolts are placed on doors and gates, so allegorically speaking where do these doors or gates lead too? I would say they are the doors or gates to the different levels between heaven and hell. As said above, it is Thoth who holds the keys to heaven and hell, which is not surprising given that he rules the intelligence and the mind which lays mid way between the two. So given Thoth's mercurial nature it makes perfect sense why the spirits of mercury in the Heptameron are said to be able to open locks and bolts. In the stories of mythology there are usually seven gates or doors to be opened. Like the seven gates that the soul of Ani travels through in the Egyptian underworld, as described in the Book of the Dead. Properly called “The Book of Going Forth By Day”. To open these gates the names of its guardians are needed to be known, and once through them the deceased is able to enter the domain of Osiris in the Field of Reeds. (the Egyptian Heaven). There are the seven gateways that Inanna passes through to go to the underworld in Sumerian mythology, and not forgetting the seven heavens of Gnostic lore, and which are also referred to in the Heptameron. I would say it is the locks and bolts of the doors to these realms that the spirits of Mercury can unlock, therefore enabling us the knowledge to gain access to these spheres where the spirits of them can initiate us further into the mysteries, which can lead us to greater spiritual awakening. 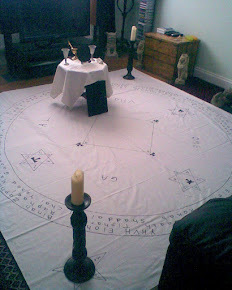 The ritual consists of the same procedure as given in my previous blog entry for the spirits of the air of Sunday, but obviously with the invocation of Wednesday instead. Purpose : To teach me further knowledge of symbolism (allegorical language) and how to apply it practically to my workings to transform my lower qualities into higher spiritual ones, to give me a sharp mind and the knowledge of all metals, to heal my infirmities and further my spiritually development. To appear in my dreams and teach me that which I need to know. Comments : During the rite when I stated my petition, I felt a connection, and the wind outside suddenly sounded way much more powerful. It even started making a sound through the air vent in the chimney breast, which it was not doing before. This added to the atmosphere, and for a short while I actually felt apprehensive and slightly panicky. I wanted to open my eyes and look behind me, but I didn't, and took it as a sign of acknowledgement for my petition. I was not expecting anything like that to happen straight away because I was only seeking contact in my dream state. Diary extract 27th January 2011. I went to another country which I thought was Iran. When looking at it from high up above it was very green, and also contained two bodies of water with a river running between them. There was a war going on there in this country. Next I was with a group of people in a quiet location, they were making Persian rugs. I bought two which were an orange colour, and when they were cut off it was below a label that said “made in Iran in the war. Year 2000”. The rugs cost 30 but I can't remember what the currency was, but when converted into £ it worked out that the rugs had cost me £3, and now I had three rugs! There was a man who had helped me figure out the conversion rate of the price of the rugs. He was an Arab dressed in white with a white turban on his head. He was very friendly and very helpful with things he was telling me. When I was about to leave to go back home to my country, he said to me I was welcome to come back any time if I wanted to buy more rugs from his people in this quiet village. This seems like a very significant dream with relevant symbolism. Iran (ancient Persia) represents the mental plane, the plane of mind which is above the astral level. When I looked at it from above I seen the country as a vast green land, this is the symbolic colour of the astral plane because the colour symbolises growth through desire. The two bodies of water represent the two truths of the lower physical nature and the higher spiritual nature, with the river of life that the soul journeys along and is connected between the two physical and spiritual states of being. Seeing this from above means from a higher perspective in the mental plane. The war taking place in Iran (mental plane) is symbolic of the higher nature subduing the lower nature. The people making Persian rugs is symbolic of the energies of the mental plane producing higher qualities. These qualities ( the rugs) that I purchased were of a mercurial nature because they were coloured orange, which is the colour of Hod and associated to Mercury. These higher mental qualities had been produced during the war. (Event of the spiritualisation of the lower nature) As I paid for these qualities with £3, it shows it has something to do with exchanging lower qualities (symbolised as money) into mercurial qualities expressed through the trinity of mind spirit and soul, because I ended up with three rugs. Within the process was also implied a spiritual transformation of some sort for the purpose of gaining the higher mercurial qualities. This was symbolised by the Arab man helping me to convert the payment into my own currency, so I could see and understand how much it cost me. The Arab man dressed all in white and with a white turban, reminded me a bit of the picture of the mercurial spirit Ophiel as shown in Denning & Phillips book “Planetary Magick” I am certain that he represented a spirit of Mercury, but I do not know which one. He was very helpful and I did spend some time with him, I just couldn't remember the things we discussed, but, I felt that he was very helpful. Given the facts that I viewed the land from above, and the spirit told me I could come back, seems to signify to me that I had travelled to the spirits sphere! This was a very successful working, bringing to fruition exactly what I requested and in a short space of time, but also it is a process that is still continually working for me, and hopefully will continue too.